A variety of rich, European Tortes. Come visit us to see what European Tortes we have made for you, or call and place you order for your next dinner party or special occasion. Delicious cream filled pastrie puffs covered in Chocolate Ganache. Your choice of puff filling: Chocolate, coffee custard or Chantilly cream. or chocolate custard. Topped with either Powder Sugar or Vanilla and chocolate icing. Three layers of rich espresso soaked sponge cake separated by layers of rich coffee cream then dusted with cocoa powder. 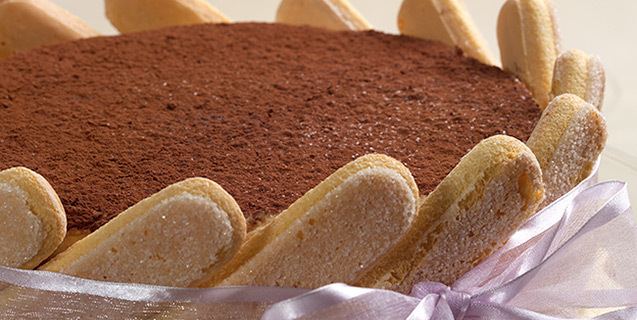 Three layers of rich espresso and coffee liqueur soaked sponge separated by layers of mascarpone cheese cream topped with cocao powder and lady finger cookies. Cookie dough crust filled with custard and topped with assorted fresh fruits. Vanilla Sponge cake soaked in rum cannoli cream filled with citrus fruit. Wrapped in fondant topped with Vanilla icing and cherries. Assorted of layers, Vanilla and Chocolate cake filled with peanut butter and chocolate mousse. A layer of vanilla cake and a layer of napoleon crust. Filled with Italian custard and zuppa inglese. Topped with whip cream filled puffs soaked in Apricot glaze. Brownie cake with chocolate fudge chocolate chips and sliced almonds. Vanilla cake filled with raspberry mousse topped with raspberry jam. Chocolate cake filled with Vanilla mousse and caramel mousse. Moist vanilla cake soaked with dolce di leche filled with caramel mousse topped with dolche de leche cream. Chocolate cake soaked in Kalhua filled with dobash cream topped with chocolate fudge and cocoa dust. Vanilla cake filled with lemon mousse topped with lemon jam. Chocolate cake filled with a layer of black cherries and chocolate pudding topped with whip cream. American cheese cake topped with Chocolate Mousse and Chocolate Ganache. Vanilla cake soaked in rum filled with Italian custard and topped with mini Rum Baba and whip cream. Vanilla cake filled with Raspberry jam and butter cream rainbow cookies all around.